From now on, you will be able to send all your travel expenses from your scanner or all-in-one printer straight to your Captio account. This means we can take care of all your business expense paperwork wherever you are. In our constant pursuit to maximise efficiency in the business expense management process, we are bringing you a new connector to give you added flexibility on the go and at the office. 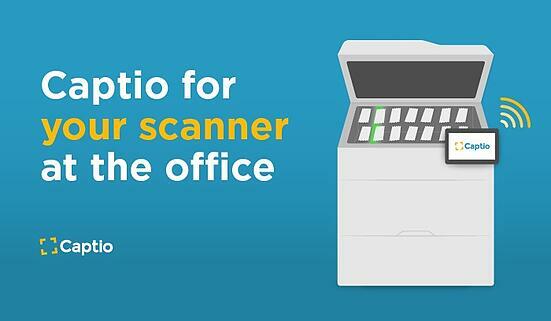 Starting today, you will be able to digitalise your expenses by using your scanner or all-in-one printer and sending them straight to you Captio account. This way, all of our customers get to link their devices to Captio and ensure they meet the Spanish Tax Agency requirements for certified approval. That means that all of the expenses you digitalise using your scanner will legally replace the original paper version. Thanks to this breakthrough, you can now link any device to Captio and use the connector to make the most of the Captio system using your scanner or all-in-one printer. That includes categorising expenses, recording expenses made by different users, inserting other types of expenses such as mileage, and drawing up reports. This functionality is a new way for Captio to boost your productivity, with the added bonus that mass scanning entails. Now, you get to digitalise several documents at a time, with automatic clipping and sending, so you get all your expenses certified and categorised and sent straight to Captio, and we will take it from there. The new connector is compatible with various brands and models and there is an API to develop connectors for all manufacturers.